Longtime readers know that the smallest treasures often make their way to the bottom of the trash bag. 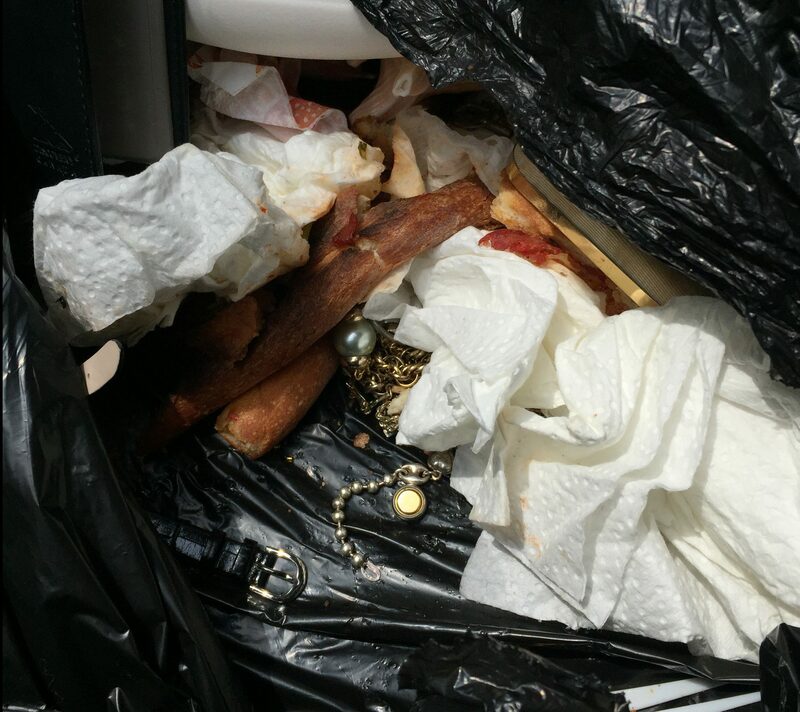 One of my best finds recently was in St Michel where someone decided to dump a jewelry box (and seemingly all its contents) into the trash along with the pizza crusts. I threw the bag in the car for later sorting because I wanted to make sure I didn’t miss anything. (Sidenote: I happened to be followed by a photographer that day. He was taking pictures for an upcoming interview in a local magazine, and I’m glad I actually found something of value in the short time we had available! Usually I end up having to feign interest in a junky pile just to get a good shot. I’ll share the interview here when it’s out). 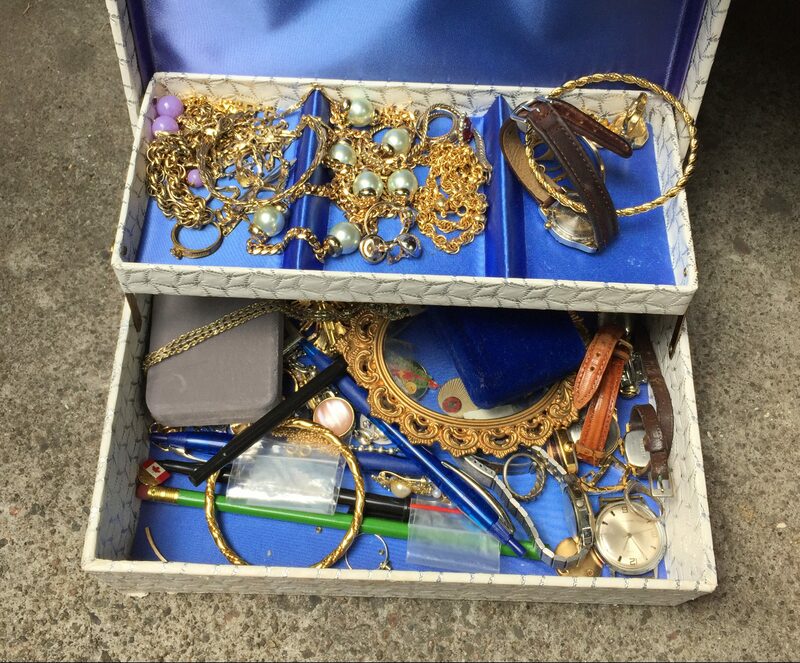 By scrounging amongst the crusts I was able to refill the jewelry box. Some pieces were indeed worthy of the trash, but most were not and some will end up being fairly valuable. 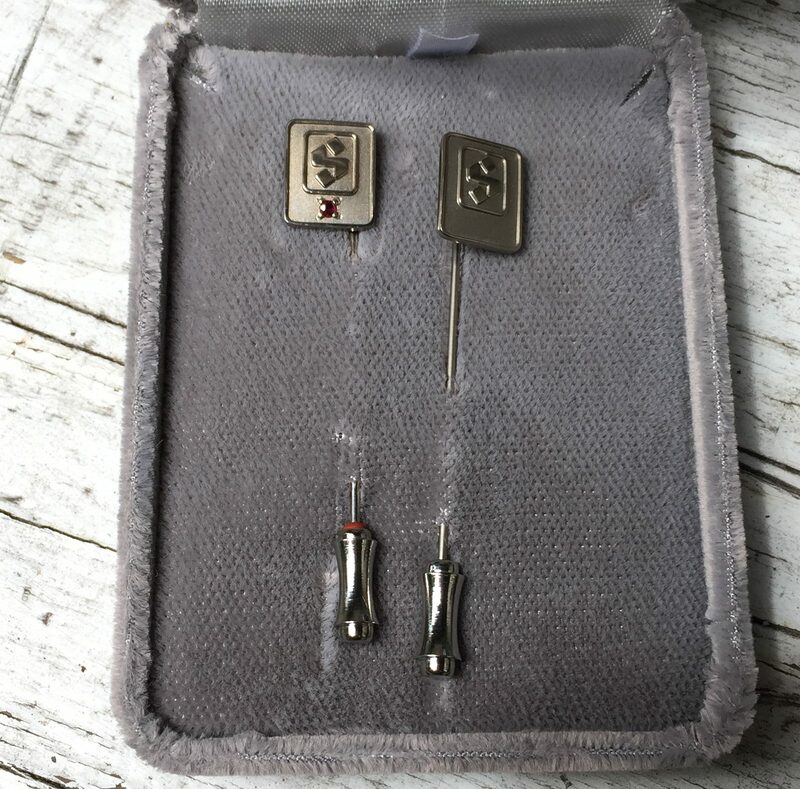 These tie pins were likely a service award given out by the Steinberg’s supermarket chain that operated from 1917 to 1992. One is silver and the one with the ruby is 10k gold. I brought these to the auction house – Steinberg’s was a Montreal institution for many years, so the name invokes a lot of nostalgia (and hopefully many bids). 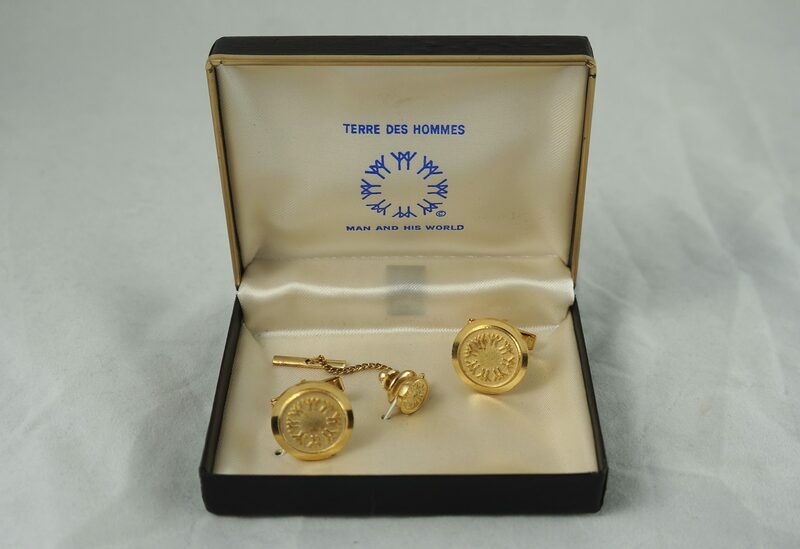 Speaking of nostalgia, I also found these cool “Man and his World” Expo 67 cufflinks. They’re in pretty good condition, and I expect them to sell for around 50-60$. Here’s the best of the costume stuff. 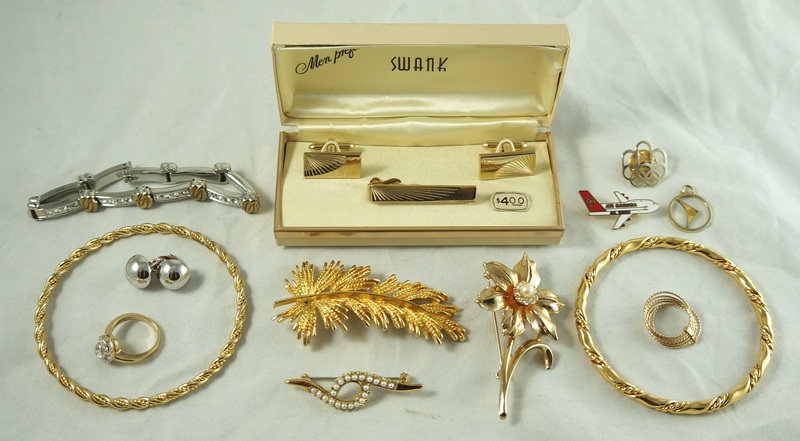 I really like that leaf brooch but unfortunately it’s unsigned. I’m mildly hopeful that the bracelet on the right is unsigned gold but that’s probably wishful thinking. Finally, here’s the stuff that’s marked as silver or gold. 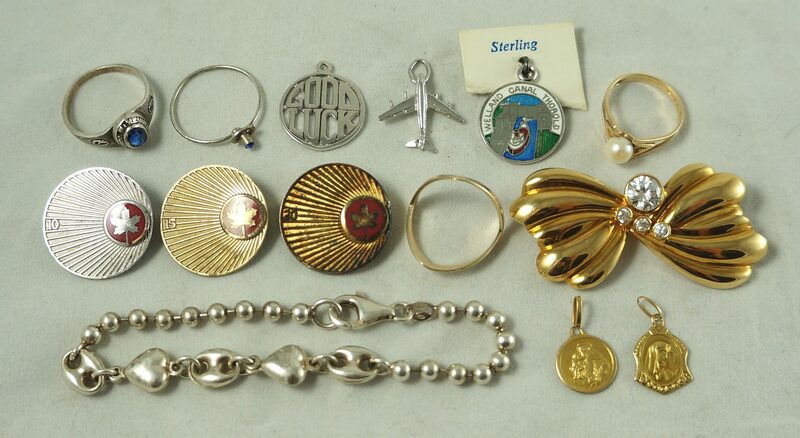 There’s three Air Canada service pins on the left, all of which are sterling silver (the latter two might be gold plated as well). The religious medallions on the bottom right are 18k gold, as is the bowtie brooch above it. Overall this was an awesome haul, and I expect that it’ll earn me four figures once it’s all processed! I haven’t seen much here (besides a box of nice German crystal since). I’ll try to keep an eye on the situation, but I’m also planning on retiring the St Michel route for a while – it hasn’t been productive for a few weeks now. I saved these items from the bottom of a bag in Hampstead. 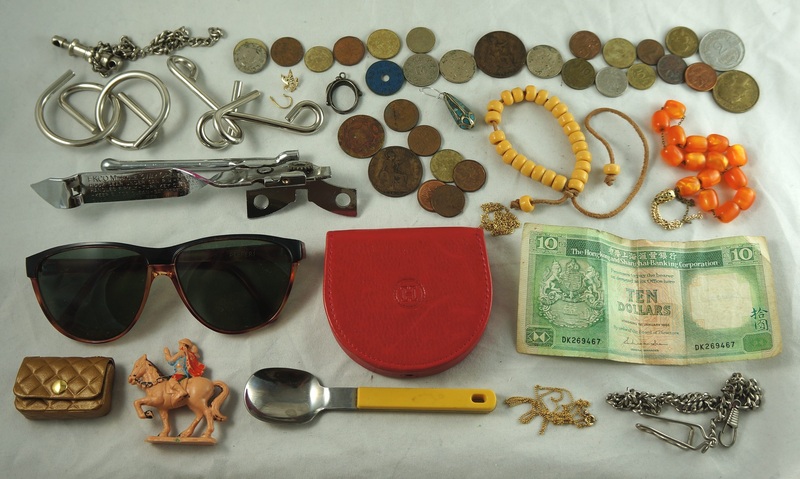 There’s a mini bottle of Christian Dior’s Eau Sauvage, a few coins, two pocket knives, a pipe reamer, a couple pins and a single bracelet link that I hope is gold. That Heil piece is actually a measuring tape made by the Zippo company, I’ve never seen such a thing previously. I actually went to an estate sale at this place a couple weeks later. They might have made a few extra bucks if they put this stuff in a box and said “make an offer,” but I guess throwing things away helps to make the process a little less stressful. Or, maybe they legitimately thought that these items had no value. Who knows. A bag in TMR contained: around 25 coins, a few of which date back to the early 1900s; a WWII food ration token; a couple of vintage bracelets (I particularly like the orange one – the beads don’t seem to be bakelite but are probably a different type of old plastic); a single gold earrings; two chains I hope are gold; 10 Hong Kong dollars from 1985; and a few other doodads. Finally, I took a look at this trash while walking around my neighbourhood the other day. I kicked a bag and heard the familiar sound of coins. 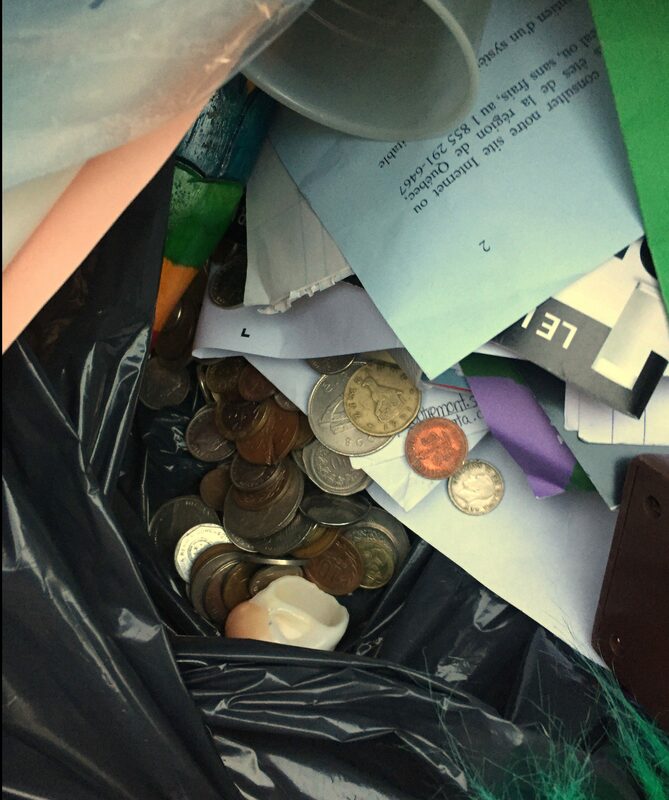 There was indeed a sizeable collection of mostly foreign coins at the bottom of the bag. I gathered them all into that empty plastic cup at the top of the photo and brought them home for sorting. Here’s a video of me dumping the haul into the light box. The coins aren’t worth much individually, but once I amass a big collection I can sell them at the auction house. 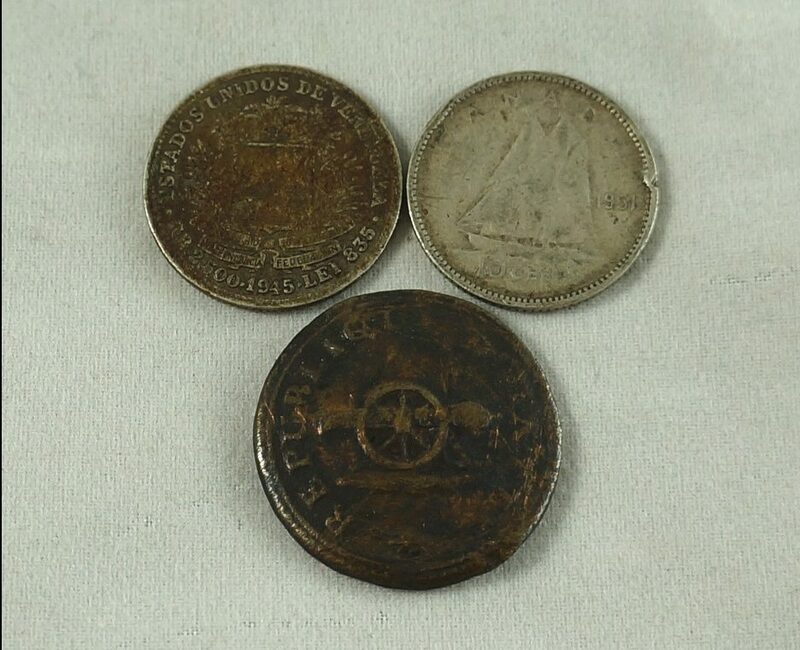 From all that I spotted three pieces of note: a 1945 Venezuelan 1/2 Bolivar (silver), a 1951 Canadian dime (also silver), and an old looking (brass?) button marked “Republique d’Haiti” featuring an image of a cannon. I couldn’t find any other buttons like it below, so if you happen to know something about it please share in the comments! In other news I’ve been quite busy basically re-organizing my whole business with the auction house in mind. I’ve cleared all the random junk I’d never have time to deal with from the basement, sorted through and organized the junk in my garage and storage, purged my stash of clothes and brought a bunch to a local consignment shop, and all the the while found more garbage that I have to deal with! At some point the work should slow down and I’ll have more time to blog. This summer has been great for picking and I’ll try to share more of those finds here soon. If the weather is good I plan on doing a yard sale this Saturday at my storage (4096 Coloniale near Duluth). I want to clear out a bunch of stuff and maybe you (and the university kids who are now returning for the fall semester) can help! I’ll start around 11am, and if it doesn’t work out for whatever reason I’ll edit this post to reflect that. Perhaps check back Friday evening just to be sure – if I have to cancel I’ll add a notice in bold below. What does that red leather box with the “H” on it look like inside? Could it be Hermes? It’s a little wallet / change purse thing. The symbol does look a bit like Hermes, I didn’t see any marks on the inside but I’ll look it up before selling it. I love your posts! They inspire me not to give up on items left to me by relatives. I have a box of jewelry that looks like the one you found here. How do I find where to sell the items? I wonder whom I can trust to offer a fair price. You could always show it to a local jeweler and see what they think. Or, if you’re familiar with Reddit you could take pictures to post on the “whatisitworth” forum – people there can be helpful sometimes. It’s important to know what’s gold, what’s silver, and so on as the precious metals tend to be more valuable (though certain costume jewelry brands can be quite valuable as well). I would be interested in the WW ration coin. I have two others that are different. Send me an email. JB@upwardsoftwenty.com Thanks! I love your posts. I will try to help promote when I can. Lots of “smalls” there. Easy to store and not hard to sell. Love the little videos. Keep them coming! The design of the lone blue “drop” earring on the pic with the “bakelite” bracelet looks exactly like a pair of rings I bought at Expo 67, back in the day … may have been from the same pavilion. A wonderful post.I am in disbelief.I always thought St.Michel was a poor neighborhood.In a poor neighborhood why would someone throw out jewelry in trash?I grew up close to St.Michel, in Montreal North and now live in the Eastern Townships.I would love to read the interview with you in the magazine when it comes out.Keep us posted. Who knows, but it’s worth noting that some parts of St Michel are solidly middle class. Judging by the service pins these folks likely had decent jobs for quite a long time, enough to buy a house and other nice things. Wife grew up in St. Michel. Working class neighbourhood and that stash of jewelry includes a John F Kennedy High school grad ring (what year? ), the religious gold medallions on the bottom right appear to be St. Anthony (left) and the Virgin mother. Considering the medallions and the JFK ring, must be family of Italian background who worked at Steinbergs and Air Canada. That’s a good educated guess. I can’t think of the year of the JFK ring offhand, but my gut tells me that it’s from the 70s. Congrats on the finds! It seems that any area of town can produce good items for the dedicated searcher. The “vintage bracelets” look like they could be worry beads. I am glad to read that this summer has been good for picking. I also look forward to the upcoming article (!!) and admire that your strategies (such as taking more stuff to the auction house) continue to evolve. Thank you for another great post. You never cease to amaze me with your excellent reports on what people throw away! Love your blog, the treasures you find and the fact that you are saving many wonderful pieces from the trash, while making some money at it. Keep up the good work!